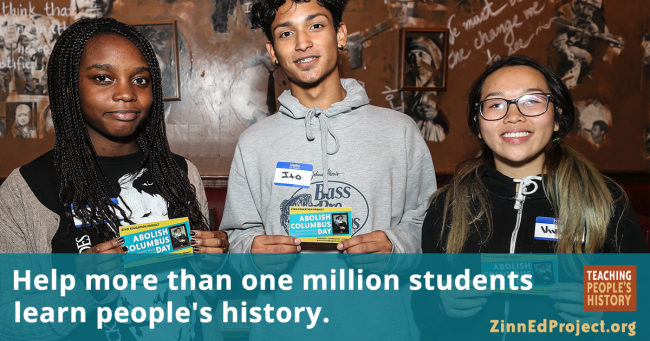 Many thanks to the 225 people who donated to support the Zinn Education Project on Giving Tuesday in 2018. Because of your generosity, more teachers will help students learn people’s history. Donations made for Giving Tuesday totaled $25,668, exceeding our match pledge of $10,000. We are overjoyed to report that in all we raised $35,668! The generous match was made by Dave Colapinto. Dave was a student of Howard Zinn’s at Boston University and currently works to promote the rights of whistleblowers. To everyone who donated — whether $5 or $5,000 — we are truly grateful for your support. We are inspired to reach more educators and students with people’s history lessons you won’t find inside a textbook. We loved reading the dedications and comments along with the donations. Here are some of them. These donations will help us reach more teachers and students with people’s history lessons in 2019. It is not too late. Please donate today.